We’ll all be here when you get everything sorted and can come back. Good luck with it all in the meanwhile! One of the few nice things about Facebook is that the [Like] offers a menu of emoji, including one for commiseration. My [Like] is in that spirit. Time sinks do tend to come in busloads. Hope the files on Flickr find a good home and that the transitions to a new camera and a new editing regime go smoothly. I really appreciate this kind comment. The Flickr project is a real slog, but both the camera and editing issues are things that I feel like I chose, so I am happy to invest my time towards that. Will look forward to your return!! I hope everything goes well for you and that the break from this blog helps you. I’ve enjoyed your work and look forward to seeing you when you come back! Thank you very much. I have always enjoyed writing this blog and being a part of the community here, so I will look forward to coming back and also to seeing you then. Best wishes, P J B! My experience with both Canon and Fuji is great so whatever you’ve chosen it will be ok. I’ve never liked Flickr and didn’tr use it much (my account stopped working years ago and never managed to close it). As far as Luminar: I did not like the move to cc so I am using Lightroom classic and Luminar and I am happy of this new software, very much looking forwards, like you, to see the new version. Good luck with so many changes! They will bring new inspiration to your photography for sure! I prefer not to rely on cloud services. Hope you get it all organized. I’m doing a tidy up too. I recommend sticking with LR. They have been making catalogue apps and processing apps longer than Luminar. If you use key words like I do it helps. Thanks very much, I am well underway removing my photos from Flickr. I agree with you about the cloud, I do have actual physical backup of all my files on hard drives as well. You will be missed. I enjoy your photos and blog. My life is going to be quite hectic over the next couple of months so hopefully ​new inspiration will come in the new year. Thank you very much. And I hope the next few months are good ones for you, even if they are a bit full. I hope to see you again in the new year. All the best… until next time! Thanks 🙂 and all the best to you as well. We all need to have a break from blogging from time to time. But I am sorry you have had so much trouble, not the least with the change of Flickr. I don’t use their service, but what I have seen lately, doesn’t impress me. Look forward to having you back next year. Yes, you certainly won’t find me recommending Flickr to anyone based on my experience. Good luck to you as you sort things out, and thanks for all your kind comments on my blog posts, photos, and Twitter. I’ve decided to stick with Flickr for another year, but that’s mostly because I haven’t found an alternative that suits me and I had just finished replacing my old photos on Flickr a few weeks before the announcement. You may recall I expressed interest in Smugmug a while back, but I’ve put that on hold for now: the way the owners handled the Flickr change is very unsettling to me and I want to see more about how they act with Flickr before I dish out more cash. Thank you very much. I was wondering what you were thinking about doing with Flickr since I knew you had a lot of files there. For me, now was a good time to grab my files and run. Given the number of error messages and the amount of time it is taking me to download in an orderly fashion, I think I made the best choice for me. I had a Smugmug site for a few years, ultimately it wasn’t a great fit for me, and then they made a decision to increase the price by a fairly significant amount. At that point, I just couldn’t justify the price vs. the service that they were offering. I will actually look at Backblaze, since it does appeal to me to have a backup that is not on site here in case of a fire or theft. I appreciate you sharing that information with me. You’re welcomed! If you look into Backblaze and have questions, feel free to reach out to me and I’ll see if I can answer them. I hope everything goes on great for you. I hope your break goes well, and hope to see you back on your blog in the near future! Thanks very much, all is going well so I should be back in the new year. I hope that you have a lovely holiday season. Amy good for you to take the break and try to minimize the stress as you are able. It sounds like a huge task and wish you well with all of the sorting. Sending very best wishes. Hi Sue, thanks for your well-wishes. The sorting task is now complete, which is a relief, it also means that I am on track to be back in this space in the new year. I hope all is well with you and all the best to you and your family for this holiday season! Wishing you a pleasant retreat from the blogosphere and best of luck straightening out your technical photo issues. In the midst of the chaos, I hope you enjoy the season! I am happy to say that things are progressing well here and I am enjoying the season as well, so all is good! I hope all is well in your world too and all the best to you over this holiday season. Hi Amy! so understandable, your decision. What a huge burden to have to archive your Flickr stash. A big investment of time, I’m sure. I’ve been enjoying your photos over on Instagram while I’ve been taking a break from the blog, too, and coincidentally, I’m coming back to experiment with blogging about writing process and including excerpts of my own work, just now when you’re stepping back. I’m sure we’ll coincide again in a few months! Love that you’re staying engaged with your art, my friend! Nice, I really think that at important part of the creative process is to interact with other creative people. Thanks very much Jane, I hope you have a lovely holiday too. Oh well. Late as usual. Seems we have had some parallel travels. Been down the Flickr rabbit hole and then some other ‘life’ things as well. Best wishes to you for a Merry Christmas and a great 2019. Bon Voyage! Glad to hear it’s not just me that has a lot going on. Hope you had a lovely Christmas and all the best for the coming year, I’ll be back to a more regular schedule of visiting blogs in a few weeks. BTW, did you delete your Flickr account after getting your images or did you leave a ‘vestige’ behind? Yes, I still have an account. I have some groups marked as private, that are basically photo sharing with friends and family, every day life kind of stuff, since I am often far away from home. I did go ahead an organize those as well so that I have a) less than 1,000 and b) an organized way to take them back off Flickr when I get close to the limit. 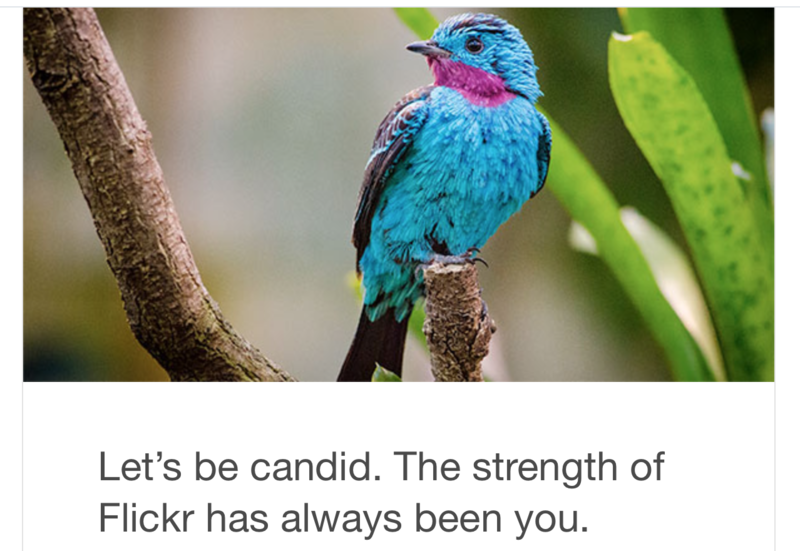 What did you decide to do with your Flickr account? I have kept the account linked to the blog (it was a ‘free’ account). Because of the 1K photo/video limit coming, I removed everything not associated in some way with the blog. The account is below 400 images now so it has room to ‘grow’ but, like you, I will have to be more judicious on how I use the account esp. regards the blog. I must say I was somewhat peeved at the 1K photo/video limit rather than setting a storage limit (e.g., say 2GB like one gets with an unpaid Dropbox account). A storage limit would let me, not Flickr, control how many images are in my account by managing how big they are. Grrr. Oh well. Yes, I agree with your “Grrr. Oh well.” completely. Glad you found a way to make what remains work for you.